Donald (Don) Glenn Ivey, principal of the University of Toronto's New College from 1963 to 1974 and the university's first vice-president of institutional relations, was known for his witty teaching of physics, both in the classroom and on popular television series such as CBC’s The Nature of Things, which he hosted for one year. A skilled tennis player, creative educator and enthusiastic communicator, Ivey, who died in June at the age of 96, won a raft of international teaching awards. The New College library is named after him, as is an asteroid. Ivey is remembered for being down to earth and having an ironic sense of humour. “He had absolutely no pretense and no pomposity at all – and he had no time for anyone who did,” says Kenneth Bartlett, a U of T professor of history and renaissance studies. Bartlett first met Ivey in 1980 when he served as Ivey's executive assistant after he became the U of T's vice-president of institutional relations, responsible for fundraising, alumni affairs and communications. Ivey was born in Clanwilliam, Man., northwest of Winnipeg, on Feb. 6, 1922. In 1929, the family moved to Vancouver, where his father Carl worked as an office manager in a car dealership and then started a small taxi company, while his mother Bessie Louella owned a small dress shop called Little Ladies Lovely Lines. Ivey worked in a series of jobs during high school, including a position as assistant chemist in the local Coca Cola plant. It was then that he started going steady with Marjorie Frisby. He attended University of British Columbia from 1940-44, earning a combined honours in math and physics. He said later that he tended to cram for exams, what he called “swatting up,” but in fourth year he had the second-highest standing in the university as a whole. With the war on, students did drills on Saturday afternoons and Ivey attended two, one-week army camps. Upon graduating, he volunteered for army service but was asked to assist in the university’s veterans’ programs, teaching math and physics to returning soldiers while he did his master's degree in physics there. Ivey and Marjorie married on June 28, 1944, and in 1946, they moved to South Bend, Ind., where he attended Notre Dame University on a research associateship. When Ivey received his PhD there in 1949, he considered a research job at an oil company in California, “but he wanted to leave the U.S. and McCarthyism,” says Dave. Ivey opted instead for a position teaching physics at the University of Toronto. In 1955, the growing Ivey family built a home in the new community of Don Mills, where he lived for the rest of his life. Ivey remained a physics professor at U of T until 1992. “He loved to teach and help people understand the world,” says his daughter Sharon Chin-Yee, who became a math teacher herself and whose two daughters are also teachers. Ivey served as New College’s second principal for 11 years, stepping in after founding principal Frank Wetmore’s death just four months after its creation. Under Ivey’s leadership, the college moved from temporary quarters at 65 St. George Street to two permanent buildings, Wetmore and Wilson Halls, and increased its enrolment almost tenfold. The position was very much a partnership with his wife Marjorie, says Sharon. Her mother began the U of T Women’s Association and founded the campus gift shop, as well as starting diploma framing and rose sales at U of T convocations to raise funds for student scholarships. “Dad was very proud of all she did, putting in 80 hours a week completely as a volunteer,” recalls Sharon. The roses were sold in a cart that Ivey made in his home woodworking shop, where he also created props for his TV shows and went on to make furniture for his children’s homes and offices. Students were invited to the Don Mills house for dinner and ping-pong tournaments, and parties with colleagues there always featured ham on a bun. “There was no fancy catering," remembers Bartlett. "Don saw every social function as an opportunity to connect." In the classroom and beyond, Ivey and J.N. Patterson (Pat) Hume, a computer science professor at U of T, began developing new teaching methods, such as educational videos. Their first television series, Focus on Physics in 1958, was a joint venture between the local CBC and U of T, followed the next year by Two for Physics. Their educational film Frames of Reference, shown in classrooms, won the prestigious Edison Award in 1962 and was dubbed into several languages. In 1960, Ivey became host of The Nature of Things, a position he held for one year, with Hume co-hosting on four episodes. David Suzuki now hosts the show. Ivey took an interest in the teaching of physics in high schools, co-authoring a textbook for that level, and later wrote a textbook for university students. “But the publisher was in financial trouble and it didn’t take off, so my dad paid to have it printed for students in his own classes and sold it to them at cost,” says Dave. In the position of vice-president from 1980-84, Ivey was a model for other administrators, especially as he continued to teach his first-year physics course. “Don made sure that no one thought too highly of themselves,” says Bartlett, added that he tried to emulate Don’s dedication and commitment in his own career. He has always taught a first-year European history course, with as many as 500 students enrolled. Ivey (pictured left) was a passionate tennis player, which “was an extension of his being, who he was, and clear proof of the beauty and order of the world,” says Bartlett. Dan Lang, professor emeritus in the department of theory and policy studies at the Ontario Institute for Studies in Education, played regularly with Ivey at the Queen City Indoor Tennis Club, known as the Queen’s Club, along with a group of U of T colleagues. 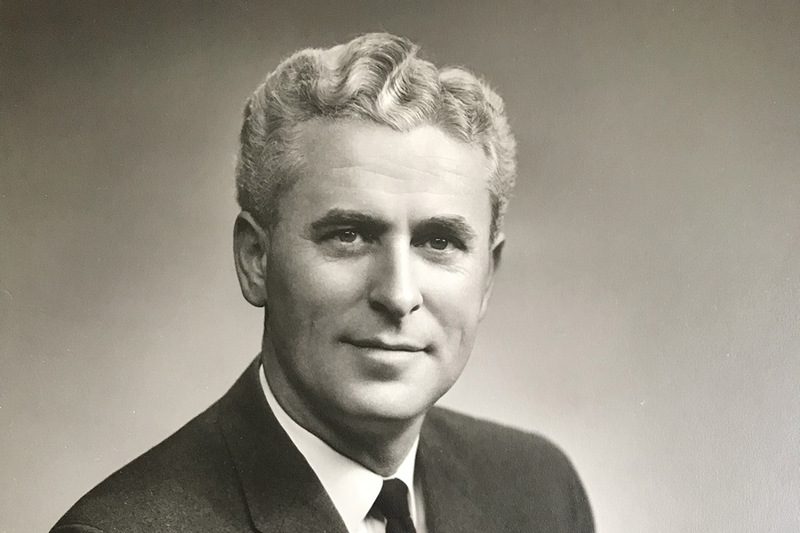 “Don not only loved to play tennis, he loved to win at tennis,” says Lang, a former U of T vice-provost and vice-president who helped Ivey set up the vice-president’s office. “For every point he had a plan,” he recalls, noting that Ivey employed strategies “much like a boxer practising multi-punch combinations. Ivey remained devoted to the sport and won a number of international tennis titles in his senior years. When he turned 90, friends and family gathered for a celebration on the tennis court, following his daily game. “Even at 90, Don was very difficult to play against,” says Joan Foley, professor emeritus of psychology at U of T who also regularly played with Ivey. Foley, who was U of T’s first female provost and first female principal at U of T Scarborough, says that under Ivey’s leadership, New College brought a new program of women’s studies into its curriculum. The contributions of Ivey and Hume to science were recognized by the naming of the asteroid HumeIvey. The asteroid was discovered in 1995 and named for the two professors by Robert Jedicke, a U of T science alumnus who is now a professor with the University of Hawaii Institute for Astronomy, and his brother Peter Jedicke, a Western University alumnus and former president of the Royal Astronomical Society of Canada. Ivey died on June 25. He was predeceased by his wife Marjorie. As well as Dave and Sharon, he leaves his daughter Donna Ouellette, six grandchildren and two great-grandchildren.